Regular Rate $2199 . Today Only $499! Guests at the resort enjoy Hobie cats, kayaks, sailing, windsurfing, tennis, waterfall swimming pool and shopping. The fitness center, open daily, caters to health-conscious guests with a stair climber, elliptical machines, stationary bikes, treadmills and free weights. For a relaxing visit, book a visit in the beautiful spa or practice your back swing on the golf course (fees may apply). At night, watch a movie on the beach or participate int he resort's exciting theme night parties. Sometimes pictures of places are so much prettier than the actual place, but this was definitely not the case. While the pictures were beautiful, the place was so much nicer in person. Incredibly friendly staff and most speak English well so communication is no problem. Numerous restaurants and the food was amazing, plus they have 24 hour room service. You won't be disappointed in staying at this hotel. Featuring amazing tropical views from a private balcony or terrace, the Junior Suite is elegantly decorated in the tones of the Caribbean with dark mahogany furniture and marble floors accentuating classic details. Step inside your very own private sanctuary of elegance and tranquility and sleep on one of the most relaxing beds in the Caribbean. A separate seating area is equipped with a roll away bed for added comfort. The rooms are air conditioned with one King or two Double beds and feature deluxe amenities such as , cable TV, daily refreshed mini-bar, electronic safe and 24-hour room service and Wi-Fi Internet. The beautiful Capri Island (located in the Mediterranean Sea, in the south side of the gulf of Napoli, Italy), due to its beauty and captivation, has been considered as a perfect destination for leisure travelers since the epoch of the former Roman Republic to date. Contemporary Mediterranean Cuisine (reservations required). We had 5 Nights here been beautiful, staff has been friendly and good has been great - we want to thank BookVIP for letting us at place like this for such a low rate! The food is really good, it's 24 hour all inclusive, you can order anything they will take it your room to your no problem, drinks are great and the whole experience was amazing. We booked through BookVIP with no complications so go ahead and do it and wont have any regrets! It's absolutely gorgeous and we definitely recommend BookVIP! This was honestly the best holiday I've ever had. Upgrading to preffered is a must! Having an upgraded room with beautiful views, upgraded free mini-bar, excellent room service included in the price - everything to make this a very relaxing stay! The private pool with the beds was outstanding - waitor service for drinks and midday snacks was a dream. There was so much on offer, we didnt manage to do everything! Could not fault the service. Also, I loved the animals that came round every few days that you could have pictures with! I've got pictures with parrots, monkeys and lizards! "A Fun Time Was Had By All"
Just spent 7 days at the Unlimited Riviera Cancun Resort and had an awesome time. Beach was great, food was great, service was A-1! We were a group of 16 and had no problem being accommodated in most of the restaurants. Rooms were very clean and beds were very comfortable. We spent New Years at the resort and had a fantastic time. Special shout out goes to the Entertainment crew who worked hard to ensure that all guests were entertained and changed up the activities daily. Would definitely return!! But first they would have to fix the road going in - a little rough! "Extended Family Vacation for Christmas"
This was an extended family vacation for myself and 17 others ranging in ages from 5 months to 85 years old. Our stay spanned December 21, 2013-December 28, 2013. I have been to several all-inclusives before, one that still ranks highly on my list and the other that I will never set foot in that particular country again because of. Now Sapphire, reaffirmed that there are other great resorts after my previous bad experience. Our stay was booked through a travel agent and we opted for the Preferred Club accommodations, which I do recommend. THE RESTAURANTS: Market Cafe- Typical buffet style all-inclusive foods, with a heavy Mexican flare. If you eat here for dinner they do offer a themed menu. Cibu- Delicious, probably my favorite. Eclectic menu and extremely polite and helpful service staff Bluewater Grill- Good for lunch twice at the most as the menu is fixed and you will get sick of repeating. For dinner it becomes a steakhouse with decent t-bone and ribeyes. Although a bit windy at night, you can't beat steak under the stars. Paramour- It got high praises from my family members, but due to the adults only restriction my wife and I did not dine here. Lemongrass- Teppanyaki grill was good, however similar to many in the United States. The appetizers, soups and salads, were the differentiating factor over the standard US Japanese Steakhouse Fresco- Very good traditional Mexican food. Dishes are very heavily corn based. CoCo- What isn't to love about soft pretzels, croissants and as much espresso as you could ever drink, whenever you feel like it? The two female servers here are fantastic. It's impossible not to be happy when they greet you with such a warming smile. 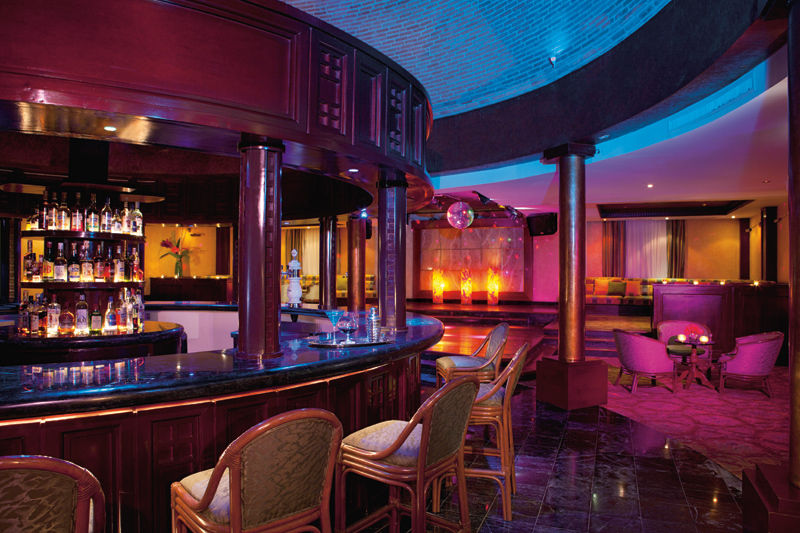 THE BARS: All the bars are relatively the same, with the Preferred Club's offering better liquor, the bartenders are what you need to seek out. Depending on who you get you may get a drink made from scratch or something heavier on the mixers. Miguel, who I found at Moments, Splash and our last night inside Eclipse knows how to make just about any drink you can imagine, he was actually making shots we found through an iPhone app the first night. At the Preferred Beach Bar, Cesar, Lemmuel and Jose all do a great job. Raul at the Preffered Pool Bar was fantastic as well. The key to the drinks at Now is asking for what you want. If you don't have a preference then don't expect to get the highest quality liquor. If it matters to you, you have to speak up, or you will get rail liquor. I found that the best liquor was at the Preferred Club Pool (which also had a wider beer selection) and inside the Preferred Club Lounge. ROOMS/HOUSEKEEPING: Our room was perfect, the bed always made when sleeping children permitted housekeeping to clean. They actually mop the floors every day they clean! The only hiccup was upon arrival there was no crib in our room as requested, but when it was delivered they were so apologetic it was hard to be upset. NIGHTLIFE: I only ever ventured into Eclipse after Moments had closed, to get drinks but the tone seemed to be of an under 20s crowd attempting to get drunk for the first time. Being that I was on a family vacation, we were much more prone to hang out in Moments' large seating area and play cards, massive Jenga (which they supply) or talk. CIGARS: There is a lot of lure concerning cigars in the Caribbean, specifically the pursuit of Cubans. All I can say is buyer beware, do your research. As someone who has bought fakes before, I knew what to look for. The seller that the hotel contracts, would never give me a straight answer on when she obtained the cigars from Cuba but based upon appearance, deterioration and my own previous research she was selling fakes. If you're an avid cigar smoker, bring your own from home. I don't know what else to add other than each vacation is what you make it. Mine was benefited by the people who were with me. I am so glad that my family could share this lasting memory at such a clean, family oriented, friendly resort. "Amazing hotel and terrific staff. Best all inclusive hotel I've been to"
To start, this resort is beautiful - very well looked after, pool huge - clean and lovely fountains and gardens everywhere. Myself and my partner have been to many all inclusive resorts and this is by far the best we have ever been to. After reading reviews previous to coming on holiday I have now vowed not to take them literal. Check in literally took 3 minutes, was given a cold towel and our bags were taken to our room. We had no hassle at all from timeshare people - never even saw any! Our bedroom was a double (huge bed!!) was very spacious with a nice garden view. It was cleaned daily and sometimes in the evening too. We were surprised to receive champaign and a banner across our door for our anniversary which was nice considering we were not preferred. Our mini bar was topped up daily, never had to ask and always got bottles of beer, coke and water. The pool was noisy at times but we loved the atmosphere, and would find it entertaining! The beach - not the best I've been to, but this is at no fault of the hotel, they try there best to clean up the seaweed. Restaurants were amazing. 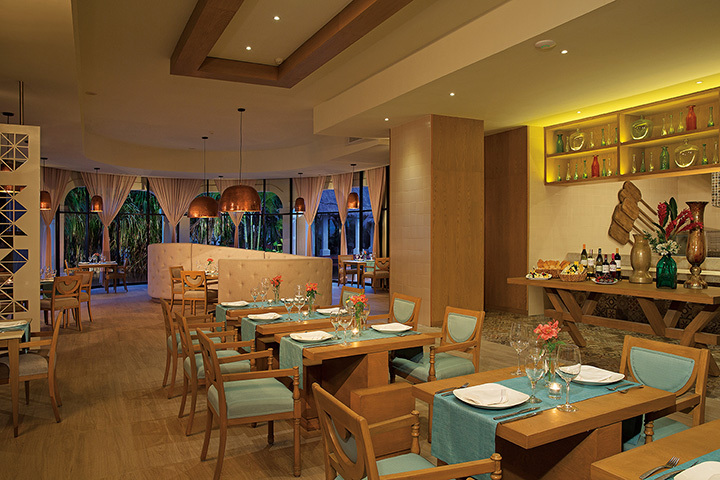 Cibu - which is a Mediterranean restaurant (not Italian to a previous review, DUH!!) was lovely, portions don't look big but it really does fill you up. I had the steak there and the risotto and it was heaven. 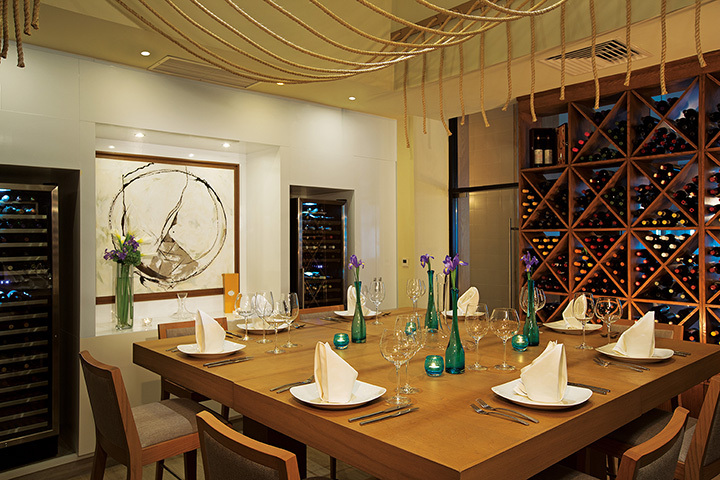 Lemongrass is an Asian restaurant split into two. One side hibachi which was so much fun watching the performance. The rice was to die for and the steak just melts in your mouth. (another review slates this restaurant - we went 3 times and did not disappoint us at all) you MUST try the fried ice cream!! 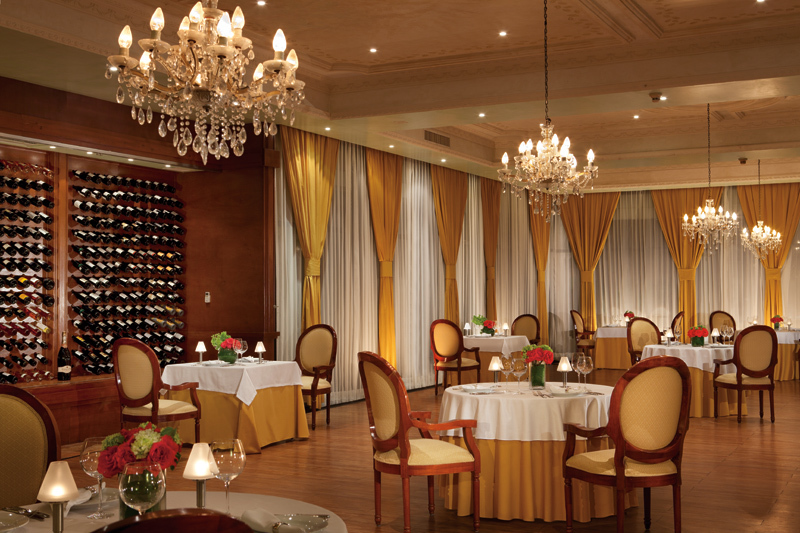 Paramour was the French restaurant, very posh!! You have to obey the dress code so men beware! (same with cibu) but the food was heaven. Again had steak there - lovely!! Blue water grill, this is open at lunch and a few evenings in the week. Was nice having a sit down meal for lunch and was nice. Nothing to shout too much about but was better than going to the buffet. Evening time was lovely, I had a T.bone steak and it was huge!!!! Lovely evening meal :) I never did the buffet as wanted to attend the restaurants. Breakfast buffet was lovely, the omelettes were amazing, the lady who makes them is very friendly and would always try to teach me a little bit of Spanish whilst I waited!!! All throughout our meals the service from the staff was brilliant, always deserved a tip. Drinks would be brought over regularly. STAFF - WOW!! Honestly the best I have ever come across. The maintenance guys would pass saying "hola" and cleaners all very polite. Bar staff by the main pool, brilliant - these reviews you read saying you need to wave a tip to be served are completely untrue. I will be sunbathing and would never need to get up for a drink as the pool staff would always offer. So friendly. Entertainment staff are hilarious!!!! They work such long hard hours but always have a smile on their faces and up for a laugh. They would go out of their way to make sure everyone was happy and on many occasions helped my boyfriend watch the football! Bar staff in the evening lobby bar were amazing, they would always top up my drink as soon as I finished it. Special thanks to Oscar who would take time out to talk to us, get me my popcorn and just being lovely. Miguel was brilliant as well as filiberto. Again, you didn't have to throw tips at them to get attention and would look after everyone. Corona was lovely, you would find at times (first few poured) the beer to be flat, this was not very often. I don't know what people are moaning about top shelf drinks. My partner was drinking jim bean and jack Daniels, Gordon's gin and absolute vodka. We were not preferred guests either. Wifi is now free!! The gym did the job, was very hot in there though. Hope I've not missed anything out, we have loved our time here and are very annoyed about the negative reviews - this is why I've gone into so much detail! I would recommend this hotel to everyone!! 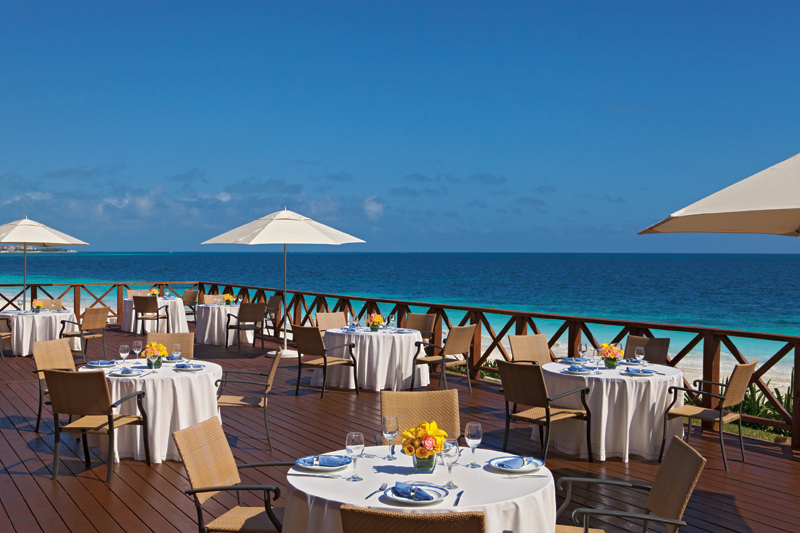 We've been to a number of 4-4.5 star all-inclusive resorts and this one shines. Resort looks beautiful and well maintained. Room was pristine and bed very comfortable. The food was also up to par, I enjoyed just about every meal. Service good as well. I'm a big time tennis nut and in that respect this place wasn't very robust, but the 2 courts available had nice surface and were in good condition. I was able to arrange for a pro from neighboring resort to hit with me. One complaint is the tennis balls would sometimes fly through the fence. In the evening there was live music by the main bar, a show and a dance club that stayed open late. On Thursday there was a beach party dinner, which was a nice change up. We did go for the preferred option and it was well worth it for us - secluded adult only pool, unlimited WiFi (good signal just about everywhere)etc. it all just built on the great value, we'll be back for sure. "Diamond Jewel Cancun is truly a gem!" We have just returned from a wonderful visit and do not have a single complaint. I am shocked to read any disappointing reviews and especially to read complaints of the food. We have been to many all inclusives and the food here was by far the best. We loved the no wrist bands and not having to sign up for specialty restaurants. The buffet food was excellent, especially the asian evening. We loved the hibachi so much that we went there twice - it was amazing. Food is always high on my list of priorities and the food here definitely gets a 5! The entertainment staff did a great job and tried so hard. The outside entertainers were not great but it was still entertainment. The hypnotist was the best, and American Idol. This is definitely a family resort and not too wild at all. Young people who want non stop partying will be very disappointed. All the staff were so helpful and friendly. We were surprised and dismayed to see how little the guests tipped. I really think all the workers deserved some extra $$ to show our appreciation of how hard they worked. They were wonderful. We walked into Puerto Morelos a couple times - a very easy walk on the beach. There was good souvenir shopping there, much more variety than in the hotel gift shop. It is a very cute little town with a nice little church. The road to the resort is horrible but since we were not driving and our vehicle wasn't getting destroyed, who cares? Just remember to add extra time to any commutes, especially after a big rain. Overall our stay was wonderful. There was something for everyone. We would definitely recommend this resort to anyone. "Huge improvement of resort in past 5 years"
I was luke warm about returning to this property, having been about 5 years ago as Paradisus, but while the bones are the same, it is very different. I usually avoid all-inclusives, but there are times when it makes sense for groups. The 2 major improvements are food quality, and the beach developed, clean and feeling safe all the way in to Puerto Morelos, giving a destination for the 45 min. hike along the beach. I'm big on walking, not lying on the beach. The individual restaurants are fairly easily accessed, no more early morning phone calls to beg for a reservation, no arm bands, overall friendly service without seeming to need tips. We had a group of 18, and generally were not tipping often, yet had fine, cheerful service (with the exception of one surly concierge on the afternoon shift). Even the daily buffets are delicious. My only complaints aside from rain every couple of days,(today torrential) is the lack of a decent red wine included with meals. I would have been treating the relatives to wine with most meals if it had been reasonably priced. One night we tried two bottles of Mexican red from the list, which totaled over $ 100, and barely finished them with 15 people, as they were not enticing. On a positive wine note, their house Sauvignon blanc / semillon blend was quite drinkable, and there is plenty of seafood which benefited from its synergy. The snails and the fillet at Paramour Restaurant were amazing. The only food horror was the pizza at Blue Water Grill @ lunch. Most frozen pizza in the US is much preferable. We also discovered that once we had befriended a few of the staff, even though some food was not readily available on a given day, our amigo would find it for us if we had the craving, such as today, coconut ice cream. My fav was actually the mango Ice cream. I'm being long-winded bout the food, and this is because at so many resorts there is quantity, but not quality, while this stay at Diamond has proven you can have quality haute cuisine in a reasonably priced resort. Went for the music will go back for the atmosphere! Loved this place away from the bustle of the city. If you just want to go an d relax and not get caught up in the bustle of a resort city go here! Food choices were good, service was great employees were extremely helpful. If I go to Mexico again I would want to stay here or a place just like it. The entire staff went out of their way to make sure that we had the very best vacation experience possible. The resort is beautiful and the food was great. We asked one of the landscape staff how to get to the spa and instead of pointing (we didn't really share a common language :-)) -- he took us there! "Diamond Jewel for a wedding 12/04/13-12/11/13"
We had a great week at the Diamond Jewel, the rooms were great, very good selection of food, the main pool was large with plenty of chairs to handle our large group. We were at the Now for my best friends wedding and the week was memorable and terrific. A HUGE shout out to Oscar in the lobby bar and all his co-workers who served us up for the week, great job guys. Irene the server at the pool and lobby was amazing, always had a hug and a smile for me. Ramone the wedding coodinator did an amazing job and made their wedding the most memorable wedding EVER!!!!! Can't say enough about the staff at the Now, they ALL go above and beyond. Sometimes pictures of places are so much prettier than the actual place, but this was definitely not the case. While the pictures were beautiful, the place was so much nicer in person. Incredibly friendly staff and most speak English well so communication is no problem. Numerous restaurants and the food was amazing, plus they have 24 hour room service. They also must do nice destination weddings, because in the 4 days I was there, they had 3 weddings! You won't be disappointed in staying at this hotel. I am very late on writing this review, but I will never forget the experience we had while at the resort. What an incredible time, food was great, service was great, entertainment was great. French restaurant amazing, despite the crazy negative reviews. And we are from NY, so super picky with our food. I would highly recommend this resort to anyone looking to go as a couple. We upgraded ourselves to the preferred package, and had access to the adults only pool and access to the preferred club room with snacks, drinks, computers, etc, which was nice after a tennis game! It was certainly worth every penny. I am not sure I would rate this resort as a 5 star, if we did not do the upgrade. The adults only pool was my daily escape, the drinks were brought to us, we were well taken care of! Great tennis grounds, really excellent resort! Upgrade to Preferred, amazing experience. You do not necessarily need the ocean view room, we had a regular room - I never saw a point on splurging on the room, you want to go see the beach, go outside. I would definitely go back there, but my husband and I every year look forward to trying out new resorts, and that is the only reason why we would not go back to Diamond Jewel. The first week of December I began my 1 week stay at the Diamond Jewel. The resort is about 25 minutes from the airport. If you are going on your own I would recommend you either go on line and look up Amstar, or arrange transfers to and from the airport with the resort. This was my third time at the Diamond Jewel in a year and a half. Everything, as usual, was exceptional. The place is immaculate including all of the public areas. The staff is helpful and gracious. The food and the facilities are great. Speaking of the food, they changed the menus in all of the restaurants. The Paramour had the most exquisite escargots (snails) I ever had. The soup and the Cibu was divine, and the Lemongrass had a seafood and noodle entree that was wonderful. This time I was "Preferred" so that entitled me to some very nice perks. 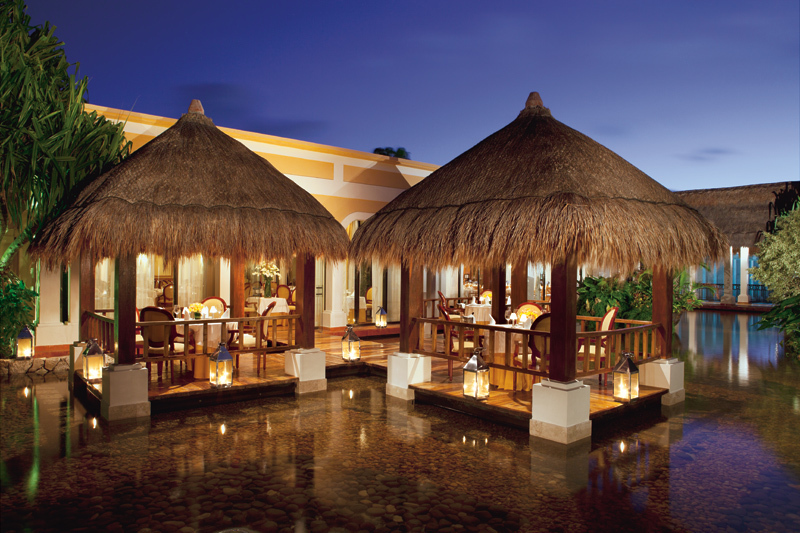 I could use the private pool and reserve an outdoor bed which was shaded by a thatched roof. At the beach I could reserve an umbrella. A very important perk for me was the unlimited use of the internet at no extra cost. The resort has handicap access throughout the public areas; however, I do not know if any of the rooms have walk-in shower stalls. If you wish to go on an excursion or rent a car there are a few companies who have staff on site. I had two massages at the spa and they were so relaxing. In addition to a hot tub and a cool tub, they have an area with jets that massage your feet, and a series of waterfalls that massage your muscles. There is even a bed that has water jetd coming at you from several directions. The spa staff really take care of you. For coffee addicts, there is a special coffee bar where you can get any specialty coffee drink you like such as an espresso or a latte. I just go to relax, but there is entertainment and disco every night and activities during the day including yoga, riffle shooting, Spanish lessons, etc. There is also a day camp for children. The resort is a 6 star all inclusive, and is a great value. I visited this resort the first week of December and it was a great vacation. This is the second Now Resort and the best part is food served for dinner. My wife and I went to all the restaurants and they were all really good. One recommendation I have is if you don't want to wait for a table make sure to get to the restaurant by 7:00 pm. Also I wore dress sandals to all the restaurants and didn't have any issues. The cibu and paramour required dress pants but the others you could where shorts. The pool was amazing the bartenders did a great job. The entertainment staff was also great they had different activities going at all times. The beach was great, the sand is very soft and there is a little seaweed but the resort has employees raking the sand. The water had a little bit of undertow but you could easily stand or play in the water. The road into the resort was a little rough but who cares your on vacation!!! It's only a five minute ride. The room was really nice. The bed was really comfortable and the room was spacious. We booked the preferred club and we were in the building closet to the pool which was worth the extra money we paid. This resort is about 10 years old so you will see a little "wear and tear" but it was nice. The only thing I suggest for this is to add a hot water hot tub outside of the spa. I would recommend this resort. This resort is excellent for families. We had an amazing time using the pool, beach and entertainment. The restaurants were excellent with both quality and variety. The staff were very accommodating and helpful. The beach was beautiful, except for the seaweed, but they did work hard to keep it clean. Beach side drink service was great (Juan Carlo is fast). Pool was nice with some fun activities. Ahmed was fun and entertaining! Food was good although the wait to be seated in a restaurant averaged 1-2 hours. Towards the end of the trip we ate at the buffet alot, who wants to spend 1-2 hours of their vacation waiting to eat... The rooms were nice and the bed super comfy. Only real downfall is we were about 25-30 min drive from Cancun and Playa...making a trip to go shopping super expensive. "2nd Time to the area"
My wife and I visited mid November and had a great time, food was excellent, staff very hospitable. We were very pleased with the trip and if I were to be picky, the resort was a little tired. We joined there vacation club and were really pleased with the upgrade / admission to the adult pool area and look forward to returning to this or one of there other resorts in Mexico. We were at the Moon place last year and while that was a larger and slightly nicer resort, this resort had more life to it, probably because the fill occupancy rate was higher and a little younger! We did golf twice and this was included but the taxi was always late, mainly due to the flooded / potholed road! There was a golf course transfer cost of $25 pp round trip and golf cart cost of $40 pp. The course was in nice shape and forgiving! We used the catamarans many times and the beach was better than the Moon Palace. This was the only resort with kayaks and catamarans out on our strip. Great location, great property, great staff members! Having stayed at several other AMResorts properties over the years, my expectations were pretty high and overall, my expectations were met. Overall, the food was pretty good, except for the buffet, which was hit and miss. 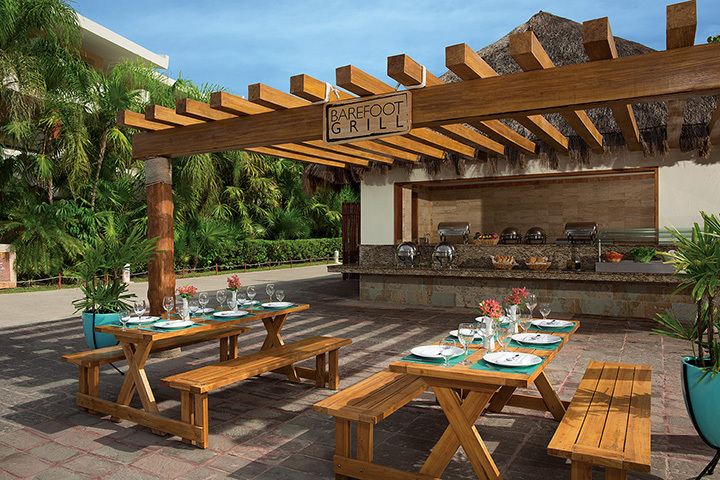 Most of the other AMResorts properties have a beach grill near the pool, which is a great option for lunch. The staff were excellent, very friendly and would go out of their way to make sure you had everything you needed. The pool staff were particularly friendly, especially Ahmed. Very upbeat and fun! We had a large group in December and had a wicked great time! The staff is top notch. 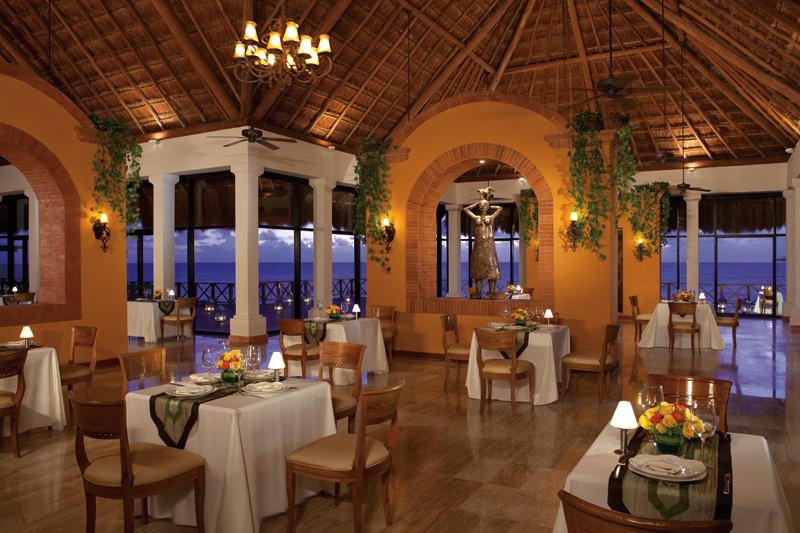 We frequented all of the food venues over 7 days and particularly loved Eduardo and Elizabeth. Our favorite entertainment staff was Ahmed. He was thoroughly enjoyable and always remembered our names! His crazy outfits always put a smile on our face. Thanks to the staff for creating memories to last a lifetime! Great place to stay. The beach is the best I've ever been. Nice soft sand. Great service on the beach too. Pool area was tons of fun especially when Ahmed was there. Great entertainment. Need to give a shout out to Ahmed! Awesome, fun guy! The best out there. Just spent four days here. We were pleasantly surprised by almost everything. It was my first all inclusive stay so I was somewhat skeptical. The food was fantastic for the situation. Our favorite was definitely the variety of breakfast. The rooms were very clean, but a tad musty. Service was above and beyond what one would expect for the price we paid. Would definitely recommend it! The hotel facilities are excellent and the service provided is very good, there are several activities during the day and animator are always available for help. Particularly i found Francisco to be a nice person and gave valuable support on information about activities and places to visit outside of hotel. Food was very nice and all incluisive concept is very good with plenty options to get food or drinks at any time. 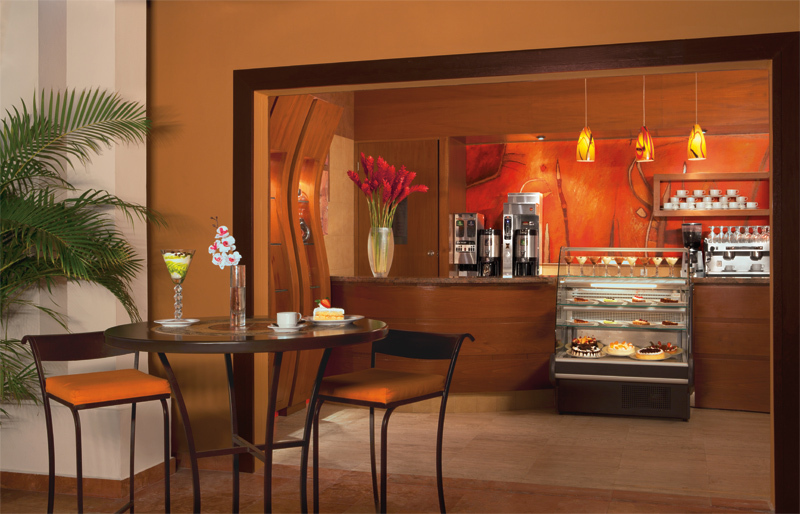 Pool bar associates are very friendly and supportive on advice for drinks and snaks. We wanted Puerto Vallarta but our choice was a bit beyond our budget. So we rolled the dice, chose Diamond Riviera and did not regret it. Food was surprisingly very good and diverse (the Mexican was the only & ironic disappointment), fine beach (very few sales people and not aggressive like at PV), lovely, comfortable room and excellent staff. We did our own deal for snorkeling the reef just adjacent to the hotel. The $40 round trip, 3 km cab ride into the fishing village of Puerto Morelos is worth it; better shopping, good eateries, friendly people. We shall return. I came back yesterday from the Diamond Riviera Resort. This resort exceeded my expectations! It is beautiful with its massive pool set against a white powder sand beach and brilliant turquoise water. The food was artfully presented. I had to take a picture before I ate it . We stayed in the preferred club rooms. The rooms and the property itself are spotless. We had 2 double beds, a sitting area, a balcony with a garden view and it was so peaceful to sit on the balcony in the morning and listen to the birds. The preferred club pool was steps away, as was the beach. The staff at the hotel was very friendly, and couldn't do enough for you. We had robes and slippers in our rooms and a fully stocked refrigerator, coffee pot with coffee and assorted tea that was replenished each day, an ironing board, iron and hair dryer. Preferred club guests get a private check in lounge and free internet. We had no trouble making reservations in any of the restaurants. We saw the concierge right after check in and made our reservations. You owe it to yourself to visit this resort! Regular Rate $ 2199 . Today Only $499!